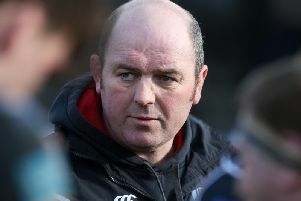 Winger Robert Lyttle said Ulster cannot be feeling sorry for themselves as they look to put a disappointing 30-7 loss in Glasgow behind them. The Guinness PRO14 loss at Scotstoun still left Ulster in second place in Conference B and in control of their play-off destiny. However, both third placed Benetton and fourth placed Edinburgh took the opportunity to close the gap on the Irish Province. Benetton picked up two points in a surprise 27-27 draw with Conference B winners Leinster in Dublin - and that moved them to within two points of Ulster. Edinburgh closed the gap to three points with a 20-12 comeback win at Scarlets, leaving the Welsh side almost out of contention for the two remaining play-off spots and automatic places in next season’s European Champions Cup. Ulster face a tough test again this weekend when they return to Scotland and take on Edinburgh which is a huge match in the penultimate round of regular league games in the PRO14. 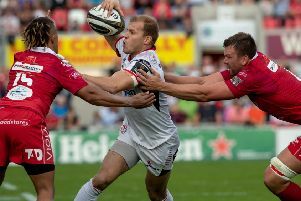 Ulster produced a disappointing performance against Glasgow in spite of taking an early 7-0 lead. Defence coach Jared Payne said if they produced a similar performance against Edinburgh, they would suffer again. Lyttle had a potential try disallowed during the game on review by TMO, pictures showing that he may have come up slightly short. It was a number of scoring opportunities spurned, centre Luke Marshall losing control of the ball as he crossed the line. Lyttle said: It (the result)was very disappointed, we left a few tries out there as well and a couple of tries for them that were soft from us, but we just need to go again next week. “Yeah any chance they got they scored from it,” added Lyttle as he identified the difference in clinical edge between the sides. “ We had multiple chances but probably were not as clinical as we had been in weeks gone by, we will definitely review that hard. “We cannot be feeling sorry for ourselves we need to get straight back on the horse and go again for Edinburgh,” added Lyttle.